This is the experience of most authors. We say we “write books,” but really we write words. Then we put them in a FedEx box and give them to a publisher, who performs a ritual upon them that eventually spits out a book. Most writers don’t make books, they make words, and then they sign over rights to make books to book-makers. It’s not always a bad thing. As Chris notes, the book Continuum made for The Textual Life of Airports is well-designed and attractive, delightful to hold, a nice size, laid out well. It’s also $100 in a hardback-only edition, which means that no normal human beings will buy it until Continuum gets around to publishing a paperback edition. All of which just underscores the point: authors rarely make books, where a book is an object with certain properties meant for the lives of readers. And hold up before you say that the publishing industry is the problem. Sure, self-publishing puts more apparent control in the hands of an author, but the reality of print-on-demand (POD) printing and eBooks is one of far less design control than was ever possible in offset printing. Books can be designed. POD books just get uploaded and pressed out. They are the lunchmeats of publishing. 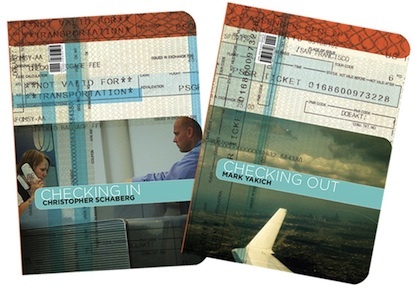 Shortly before The Textual Life of Airports dropped, Chris and his Loyola colleague Mark Yakich put together another book, Checking In / Checking Out. It’s a two-sided book about airports and airplanes, one written by each author. The size and shape and feel of the book resembles a passport, and the effect just makes you want to carry the thing with you when you travel. Which, of course, is the perfect time to read it. As the LA Times put it, “About 5 by 6 inches, small enough to tuck into a jacket pocket or a purse, it’s easy to carry, doesn’t take too long to read, and is quite nice to look at. And if you carry it on a plane, you don’t have to turn it off.” To produce that effect, Schaberg and Yakich had to write, design, print, market, and distribute a book—a real object in the world. Not just a series of words on pages sent to a publisher. I’ve certainly found myself thinking more and more about this over the years (and asking more and more of my publishers). Both Racing the Beam and Newsgames are books whose physical size, heft, and feel very much please me. They are readable and attractive and desirable as objects. Likewise, How to Do Things with Videogames was made with readers in mind… short chapters, small form factor, inexpensive paperback edition from day one, and so forth. A book people read and finish. And hopefully enjoy having and experiencing as much as they enjoy reading it. And of course, I put laborious effort into the creation of A Slow Year, which is a book despite also being a videogame. Experiences like these have made me realize that books are not just boxes for ideas. They are also things in the world. In my forthcoming book Alien Phenomenology, at the start of the chapter on Carpentry (my name for making things that do philosophy), I talk about the chasm between academic writing (writing to have written) and authorship (writing to have produced something worth reading). But there’s another aspect to being an author, one that goes beyond writing at all: book-making. Creating the object that is a book, that will have a role in someone’s life—in their hands or their purses, around their mail, in between their fingers. Now, in this age of lowest common denominator digital and POD editions, it’s time to stop writing books and to start making them. To that end, I’ve started working with Minnesota on an unusual and possibly unreasonable alternative way to experience Alien Phenomenology in print form, for the select few who might be interested in a physical incarnation of my object-oriented philosophy. More on that soon. Great idea! For other examples of books being designed as objects I recommend the German Herrmann Schmidt publishing house. Has some clever cover mechanics. It consists of multiple smaller books inside a bigger sleeve with cut-out holes. Depending on how your arrange the smaller books, it changes the appearance of the cover. Some other cool effects inside each book. The book has a handle built-in so you can carry it like a briefcase. Useful, since the book is quite hefty. It contains some creativity excercises that can be used in meetings. About the activity of reading itself. The book is designed to subvert and disrupt it’s own reading to make some of it’s arguments. But I think the best example is “Das Buchobjekt” by Robert SchÃ¤fer. It’s a book that explains how individual parts of a book and it’s layout are called by actually printing captions and descriptions ON THEM. I agree overall, but I do think more interesting things are possible with POD than are usually done, so maybe mildly object to the dismissiveness. If your main interest is in the physical book, then yes, there is a relatively constrained range of choices. But there is a lot more that could be done within those pages than is usually done: uploading an MS Word file with the usual chapters, columns, and section headers is hardly pushing the POD medium to its limits. If you take, say, 80 pages, perfect-bound, 6×9 inches, as your canvas, there are a lot of possible ways of arranging ink within those constraints. Great examples, albeit more examples of books-about-books, but yes! I’m sure that more interesting things are possible with POD. But the reality of POD solutions is that they are currently very one-size-fits-all. That may change over time, or it may actually get worse. Certainly ebooks seems to be going in the direction of less rather than more entropy, iBooks notwithstanding. It’s curious that most of the interesting work is either on the high-end (aka, for people who aren’t normal) OR in the incredibly competitive arena of children’s books. I’m continually surprised by the some of the books I’ve seen, and I don’t mean books that play sounds, or have lights, or have bits of fur and felt! That actually gives me an idea… we need more game studies pop-up books! I’ll say on Continuum’s behalf that they included me in many of the ‘making’ steps: cover design, layout & sizing of images, etc. These should of course be expected, but I’ve heard stories from friends and colleagues of the experience you describe, where writers’ words sort of vanish into a mysterious book mill, and sometime later out pops a ‘book’; so I was grateful to be kept in the loop throughout the process. It was pretty fascinating to be working on both of these projects simultaneously, because each one posed certain limitations and possibilities for creative involvement. For its all its brevity, “Checking In / Checking Out” involved a very long process. Mark and I started writing this book in the spring of 2009, and it went through countless revisions and formats. Collaboration is messy and usually clunky; but we don’t do enough of it in the humanities, and it is definitely something that forces one to learn how things actually get made. The design of our little book was actually conceived over a long lunch (and thanks to a few pitchers of Nola Hopitoulas IPA) by our wonderful colleague Nancy Bernardo, who’s in the art department at Loyola. With our (often nit-picky) input, Nancy designed the book and came up with the cat/dog cover scheme. We couldn’t have done it without Nancy. As of today there are 14 copies remaining on Amazon, and I have nine copies of the book in my office. That’s all that we have left. When it first came out, we sent off about two dozen to reviewers and friends. So we have in fact sold the bulk of the original 500 copies. But we haven’t come anywhere close to breaking even. I guess it was a lesson in how much it really does take to ‘make books’ from start to finish. And of course, “Checking In / Checking Out” was a side project for us. Mark was finishing a novel at the time (“A Meaning for Wife”), and I was wrapping up “The Textual Life of Airports.” So the stakes were relatively low, and we’ve been pleased that the book has gotten around as well as it has. Just the other day, a representative from Ingram contacted Mark and asked how they could distribute the book globally; Mark was like, “That would be great, but we only have a few copies left…” The Ingram rep was puzzled. Sure, we could put another couple thousand dollars on our credit cards and print 500 more copies, but we’ve learned that it’s not so simple to make money from making books. And honestly, this is where I’m very glad to have Continuum managing all that for my other bookâ? ?I’ll take my measly 7% royalty, and let them keep the rest, for not having to deal with all those expenses and calculations. On the other hand, I do hope that in the future Mark and I can focus our full attention on making another book together. Or maybe several more books. And @Jose, it’s interesting that you mention children’s books: Mark and I have been imagining some children’s books we’d like to write, and if we do it, we’ll make them with the imprint NO Books. Sorry for the long comment here; call it the back story. Thanks for the additional information, Chris. Having printed a number of books (in addition to the ones publishers have done for me), I definitely appreciate the financial challenge. The 500 unit run is probably the main problem, since even at 2,000 units the costs come down considerably. But of course, these things cost money to do! And a distributor like Ingram is going to pay on NET 120 or 180 to account for returns, and at maybe 40-45% of list. So, yeah.